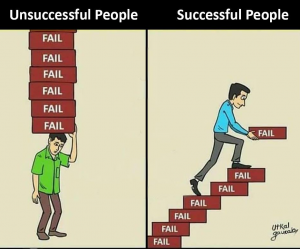 Use failure as stepping stones. You need to know what does NOT work in order to know what does. Like riding a bike. You need to try new things and FAIL, (fall down) in order to learn what you did wrong, that you will not do the next time. If you keep falling and doing the same thing over and over, then know you are not THINKING and looking for the cause of your failure. And no. it’s NOT the bike or the road you are on, or anything else you might want to blame. This entry was posted in Anger - Rage, Body, Denial, Fear - Terror, Feelings - Emotions, Heart - Heartbreak, Imprint-programs-beliefs, Life - Death, Love - Conditional, Love - Unconditional, Self-Empowerment, Society - Culture, Soul (Will) - Intuition-feelings-emotions, Spirit - (Mind) Thoughts - ideas and tagged failure, stepping stones by johnrieger. Bookmark the permalink.